Cold Stamping Foil Ospac pioneered in the development of cold foiling technology which transformed the economics and flexibility of foil stamping in the 1990s. With our optimum efforts, we are able to provide superior quality range of Cold Stamping Foils. Catering to the requirements of our clients, we are involved in offering Cold Stamping Foil. Fostered with rich industry experience, we are engaged in offering Cold Stamping Foils to our respected customers. We are one of the most favoured selections of clients owing to its precise design and high effectiveness. Our products are widely recommended by clients owing to uniform thickness and consistency. With the availability in various sized packaging, these products are available with us at feasible rates. COLD FOILING is the process of applying an adhesive to a substrate and then laminating an easy release foil on the adhesive before curing the adhesive through the foil using a UV Light source. We hold expertise in offering Cold Stamping Foils that are used in the finishing of self-adhesive labels. Available in exquisite designs, colors and finish, these foils are highly in demand. Owing to easy set up and untarnished finish, Cold Stamping Foils find wide application in flexographic or offset printing. Cold Stamping Foils is a fast and cost-effective inline process that works in conjunction with flexo, offset and letterpress printing processes.Generally silver, but also comes in a limited palette of gold, stock diffraction patterns and custom holographic designs. 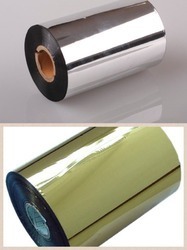 We are the importer of Hot Stamping and Cold Stamping Foil used in Paper, BOPP, PE, Lamitube, labels etc. We have foil which are used for embossing. we have our base in new delhi and can supply all India. With the valuable assistance of skilled team of professionals, we are offering an extensive range of Cold Stamping Foils. We are a unique name in the industry to provide our prestigious clients an exclusive range of Cold Stamping Foils. Cold stamping foil in silver / gold/ matt gold/ silver rainbow .